Your dog isn't the only one who suffers when you're on vacation -- you miss the little furball too, and you'd teleport back every once in a while to give him a treat. Well, now you can. Sort of. Enter, the Furbo. 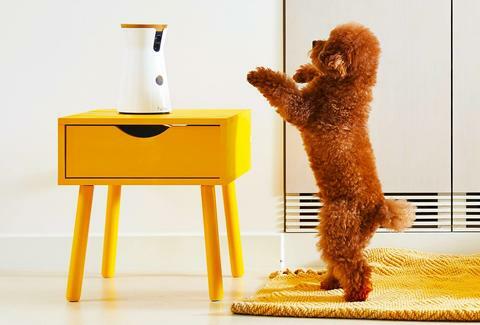 By combining a dog treat-tossing camera that syncs with an app, the Furbo allows you to talk with your dog, and throw him/her a treat when you're away from home. This cool gadget has two-way audio, and will even send you "bark alerts" whenever your dog starts up, allowing you to ease his anxiety with a treat right away, or tell him to shut up. That second one is pretty mean. And you can check up on your pup at any time of day, as the camera has night-vision, too. Also, if your dog is in an especially adorable mood, you can snap photo and video to be shared instantly on social media. Finally, the Furbo is Apple Watch compatible, which you might find convenient if you're one of the few people who actually have one of those. Since its launch on indiegogo in April, the Furbo has already raised over $250,000. With that money, the brand plans to get the device ready for shipment by August, 2016, but you can totally purchase one now on the indiegogo page for $119. Purchase one, and you're on your way to becoming the best dog mom/dad ever, or just a really clingy dog mom/dad. Kara King is a News Writer at Thrillist and hopes to be a good dog mom someday. Send news tips to news@thrillist.com and follow her at @karatillie.